In strong winds it’s important to reduce the drag from your sails even further by flattening out the fullness as much as possible and twisting the leeches to reduce excessive heel. The backstay should be tensioned for maximum mast bend, so the mainsail starts to blade-out (giving you maximum flatness). You can tell if the backstay is tensioned on too much as the mainsail will get quite pronounced creases running diagonally from the luff to the leech, these are referred to as ‘over-bend’ creases. 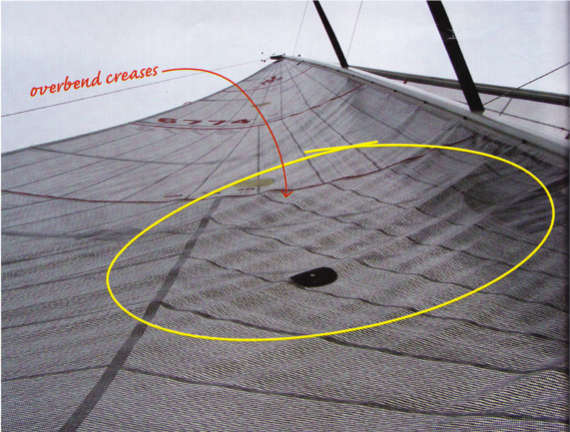 Over-bend creases will also result in your mainsail leech twisting-off or laying-off, which will reduce your pointing ability considerably. If you see these over bend creases starting to appear, ease the backstay until they just disappear and this should be your maximum backstay tension. The Cunningham eye (or luff tension) should be on quite hard to keep the draft forward in the sail and the outhaul should be tensioned quite hard to flatten the foot area completely. The traveler should be worked quite aggressively up and down through the gusts and in lighter winds to keep the boat on its feet. I have found a lot of crews have a tendency to reef the mainsail far too late, waiting until the boat is over-pressed and the mainsail is flogging excessively, i.e. Back winding. A reef in the main will dramatically improve windward performance with less leeway and better boat speed. The genoa or jib should be trimmed with the genoa car set well aft (up to300 to 400 mm aft of the optimum sheeting point) with the sail tensioned in on the sheet to approximately 20mm from the spreader tip and even inside the line of the spreader on shorter footed headsails. This will really flatten the foot area and allow the top to twist off to depower the headsail. It is important to have the backstay at maximum tension to help reduce forestay sag. Heavy weather headsails are cut with a lot more luff hollow to allow for more forestay sag, but excessive forestay sag will slow the boat and affect pointing ability. The helmsman should feather the boat into the start of stronger gusts making sure to pull away to the optimum windward heading just before the gust passes to keep the boat on its target upwind speed. These are mast over-bend creases taht indicate the backstay is on too hard. 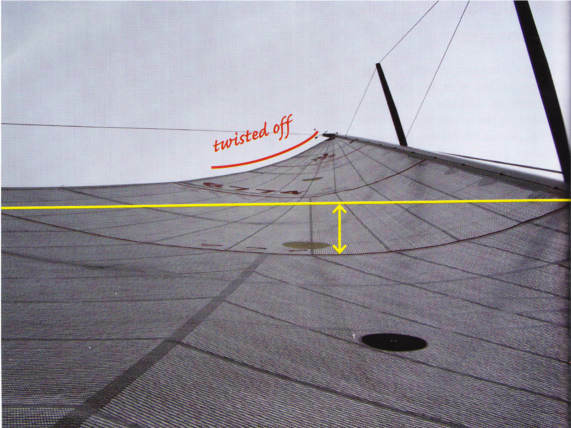 This occurs when mast bend exceeds the sail’s designed luff curve.